Very fun, but these are also serious performance socks for every outdoorsman. Made in the USA from a blend of acrylic, wool and stretch nylon, these socks are wonderfully soft and comfortable while providing moisture control to keep your feet dry. 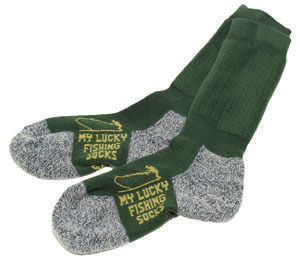 Over-the-calf length, cushioned heel and toe, excellent warmth and stay-in-place fit make these the perfect under-waders socks. Better get at least two pairs - no one wants to wear the same pair again on the second day of the trip! These socks fit beautifully, are wonderfully warm, and are as comfortable as bedroom slippers. One great product on many winter steelhead trips.